This is one of the most popular picnic destinations around Alibag. 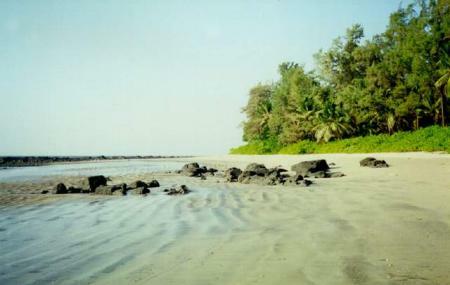 The beach is surrounded by greenery and hence the scenery is breath-taking. The atmosphere is lively but there is enough space on this huge beach for you to make your own camp and enjoy a peaceful time. Children can go play in the shallow waters and adults can enjoy reading a book or just lay by themselves down on the silky beach sand. A variety of food is available at the nearby eateries. Here you can witness a beautiful sunset as you sip fresh coconut water. Carry your hats and sunscreen. How popular is Kihim Beach? People normally club together Nagaon Beach and Undheri Fort while planning their visit to Kihim Beach. Once you enjoy beach water. You can have normal water bath at parking. Good facility in there. Well maintained and a breathtaking view to visit for!! Beach is very clean and maintained. They also have clean and well maintained public toilets. I visited this beach on weekday,pretty empty then. Nice place to hangout with friends, few options of water sports on weekends. Places to eat are limited. Cottages are plenty though.